Westfield Football Club defeated the team which was top of the table with the bare XI players on Saturday. Goals from Josh Carey and Connor Charlton, coupled with a dogged defensive display, earned Westfield an unlikely 2-1 victory away to a Copthorne side which dropped to second in Southern Combination League Division Two as a result. 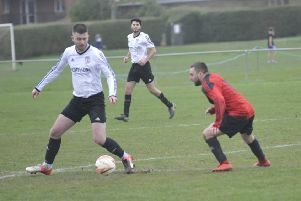 The result was another example of inconsistent Westfield’s ability to spring a surprise against the division’s leading lights having drawn away to leaders Rustington and won at fourth-placed Angmering Seniors earlier this year. Westfield chairman and defender Jack Stapley said: “We had so many players missing and it just made the result even better. “Whenever we play a decent side or we’re a bit short and the odds are against us, we seem to pull out a performance like that. I just wish we could carry it on against teams in and around us. “If we only played the top four this year we would be right up there. Playing the better sides does bring the best out of us. Copthorne were on the front foot for probably three-quarters of the match, but Westfield threw their bodies in the way in defence and goalkeeper Perry McNamee pulled off two or three outstanding saves. At the other end, Westfield took their chances when they came along, something they haven’t done for much of the campaign. They opened the scoring in the 78th minute. Debutant right-back Kwabena Asante produced a fantastic piece of skill to get out of a tight area around the halfway line and played in Jacob Shelton, who crossed for Josh Carey to smash home at the near post. Asante - another young prospect from the Stars Football Academy - had never met any of his team-mates before Saturday, but slotted in like he had played all season according to Stapley. Westfield doubled their advantage four minutes later. Connor Charlton, who had been sin-binned barely a minute into the game, broke from midfield and rode one challenge before getting the better of Copthorne’s centre-half in another and calmly slotting home. Ben Ferguson made a brilliant block on Westfield’s goal-line moments later and although Copthorne, who played with the gale at their backs and down the slope during the second half, pulled one back in the 89th minute, the visitors weren’t to be denied. “A massive thing for us is having Josh Carey available,” added Stapley. “He just adds something to the side that we don’t usually have - pace, power and an unpredictability. He always seems to pop up with a goal or a cross for a goal, and that was the difference again. Westfield: McNamee; Asante, Stapley, Charlton, King; McGurk, Higgins, Ferguson, Shelton; Carey, Churchman. Westfield, who are back into the division’s top 10 with three games to go, will host bottom-of-the-table Ferring this coming Saturday. Stapley said: “It’s a long way for them to come and on paper we should win comfortably, but it’s a real banana skin to be honest. Asher Grindle is available now having changed jobs, while Martyn Durrant hopes to be fit enough to play some part in a friendly against Bexhill United tonight.